Barack Obama has won the presidential vote in Florida – widening his electoral victory margin over Republican rival, Mitt Romney. The vote count in the only state which had not declared a result from Tuesday’s election gave Barack Obama 50% to Mitt Romney’s 49.1%, according to Florida state department figures. Barack Obama has now won 332 electoral college votes – Mitt Romney has 206. The Sunshine State’s famous “hanging chads” sparked a crisis in that year’s Bush-Gore election, eventually leading to a Supreme Court ruling that installed George W. Bush in the White House. 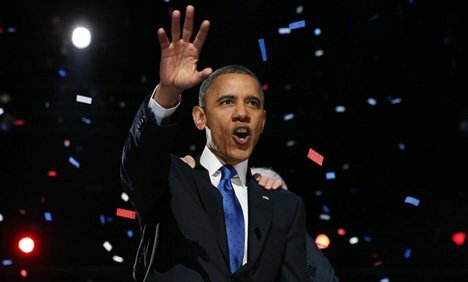 The figures released by the Florida state department suggest Barack Obama won 4,236,032 votes out of a total of 8,471,095 cast – 73,858 more than Mitt Romney and well above the 0.5% difference which would have triggered an automatic recount. The result will not come as a surprise to either President Barack Obama or Governor Mitt Romney – it has been assumed that the president would win since late on Tuesday. But it is significant nonetheless as it further strengthens President Barack Obama’s negotiating position when it comes to doing deals with Republicans in Congress. And because there are so many Latino voters in the state, the result will also reinforce the message that Republicans need to do more to win the Hispanic vote. Exit polls suggest that Florida’s Cuban Americans voted for the Democratic Party in record numbers. The newly re-elected Barack Obama has said the wealthy must pay more taxes under any political settlement to avert a looming budget crisis. But in a dueling news conference on Friday, Republican House Speaker John Boehner said tax rises would not be acceptable. Barack Obama has repeatedly called for the affluent to pay more, but such a plan is anathema to Republicans. The fiscal cliff would see the expiry of George W. Bush-era tax cuts at the end of 2012, combined with automatic, across-the-board reductions to military and domestic spending. Florida’s problems began even before Election Day, with lengthy queues reported during the early-voting period. They said it was a blatant attempt to suppress Democratic turnout – Florida’s African-American voters have tended to cast ballots early in previous elections. But Governor Rick Scott said the measure, passed by the state’s Republican-controlled legislature in 2011, aimed to limit voter fraud.